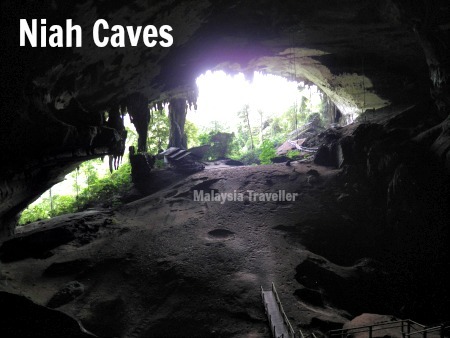 Niah Caves is usually ranked as the second best cave complex in Malaysia after Mulu Caves. 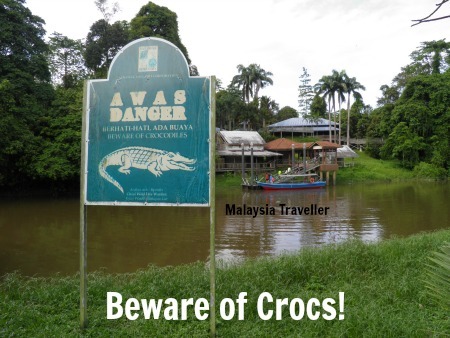 It is also rated as the best place to go in the Miri area of northern Sarawak, besides Mulu. 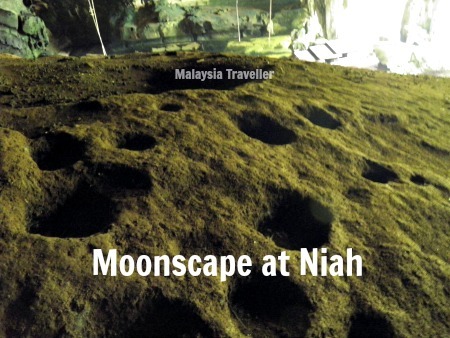 Unlike Mulu, which usually requires a flight, Niah Caves are easily accessible by road from Miri or Bintulu. 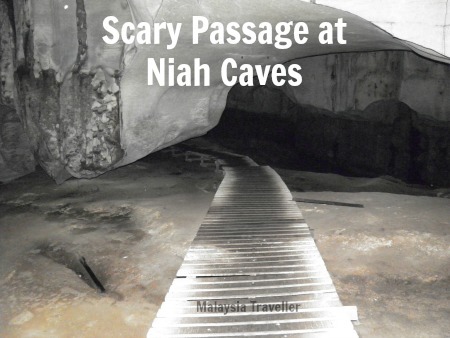 I went to Niah Caves recently and found it be a spectacular place to visit and an enjoyable day-trip. Based on my experience I have put together this practical guide of what to expect. I decided to rent a car and drove myself to the caves. 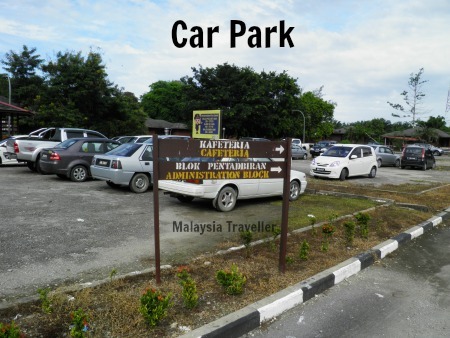 Hire cars are easily available in Miri from about RM 100 per day and up. An advantage of driving yourself is that you can stop off at some of the nice beaches on the way back. I took the coast road which is a distance of 80km with a journey time of about 1 hour 30 mins. The main Miri/Bintulu highway is an alternative route and is a little longer at 109km. From Bintulu the distance is 118km. 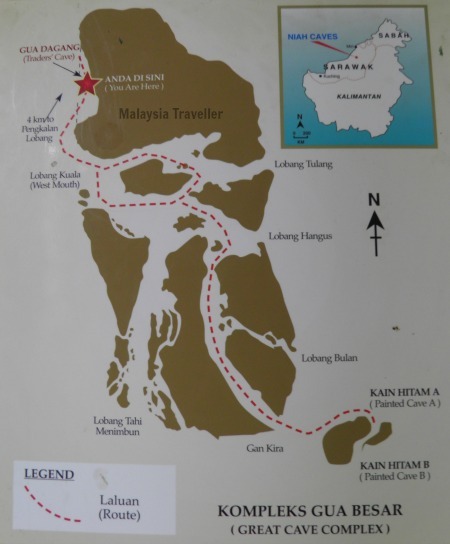 Turn left off the coast road when you reach this spot (signposted to Taman Negara Gua Niah). From here on there are brown tourist direction signs at all the important junctions showing you the way. If you don’t want to drive you could always join a guided tour offered by local tour operators. Trip Advisor advertises day trip tours from Miri at RM334 and up. Some operators charge as much as RM1390 per person. You could charter a taxi to take you there. Expect to pay at least RM 150 each way. From Pujut Corner Bus Terminal in Miri take any bus going to Bintulu, Sibu or Kuching. 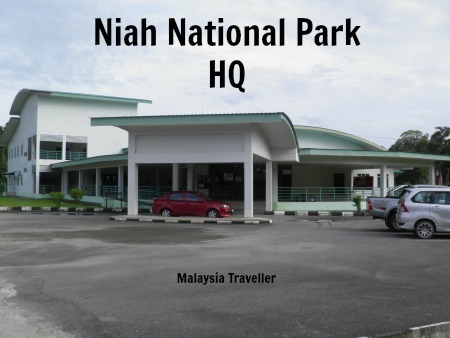 Get off at the Niah Rest Stop. Bus fare is RM15 per person. 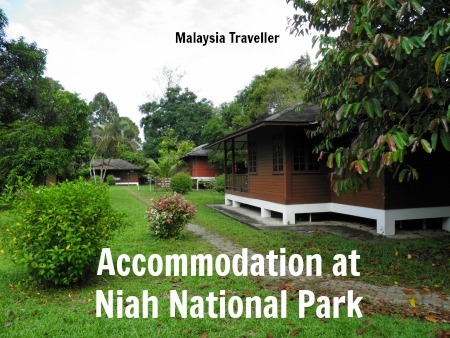 From here, take a taxi to reach Niah Caves National Park HQ (at least RM30 one-way). This is the old National Park Headquarters building which is no longer used but there is a toilet here. There is plenty of free parking in front of the Park HQ building. This is the new Park Administration block. 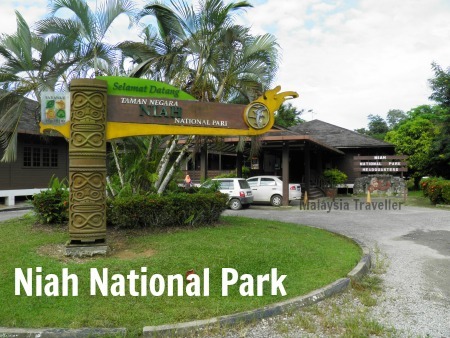 You buy your Sarawak National Parks entry pass ticket here. The National Park office is open from 0800 to 1700. There is a cafeteria behind the ticket office and after my trip to the caves the nice lady working here prepared me a very tasty fried rice and hot tea for just RM6. 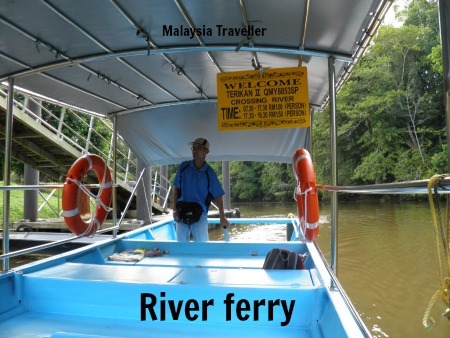 After purchasing your ticket you proceed to the river jetty where a small boat will ferry you across the river. You have to pay the boat driver RM 1 for the crossing (and again when you come back after you have visited the caves). Swimming across is not advised! 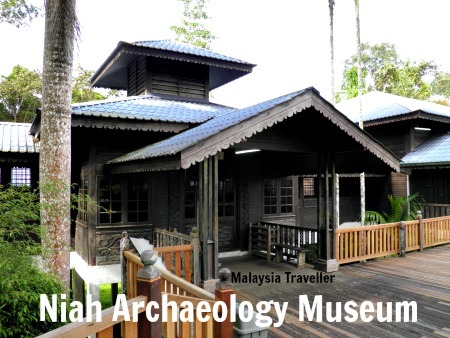 Once safely across the river you will immediately see the Archaeology Museum (free admission) giving information on the history of Niah caves and their pre-historic inhabitants. It is open from 9am to 5pm. I reached there too early and it was not yet open. I intended to visit it on my way back but by then I was soaking wet and rather tired so I didn’t go inside. 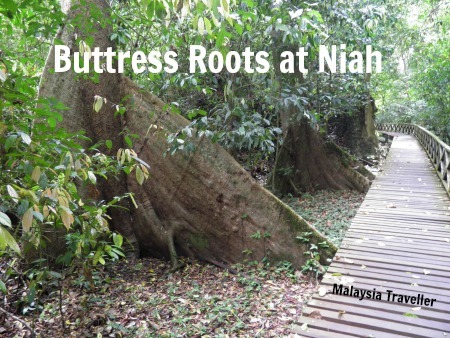 The trail to Niah caves begins next to the museum. The distance to the first cave is about 3 km long and takes around 45 to 60 minutes to complete depending on your walking speed. 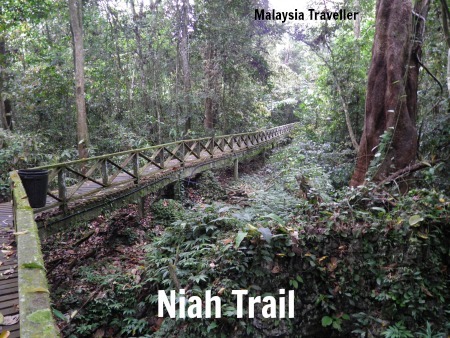 The trail mainly comprises wooden plankwalk (boardwalk) built on concrete posts a couple of feet above the floor of the jungle. In places it is a concrete path. It is enclosed on both sides by dense rainforest giving visitors a good chance to observe nature at close range. Shy birds and monkeys can be heard but are difficult to spot. Exotic butterflies are abundant. The terrain is mostly limestone providing a challenging habitat for plants with thin, fast draining soil making vegetation prone to drought despite the frequent heavy rain. 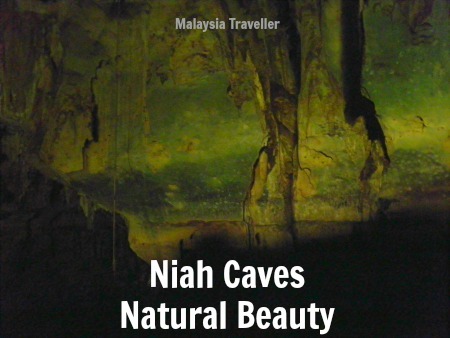 The mountain in which Niah caves complex is located is called Gunung Subis with a highest point of 394m. 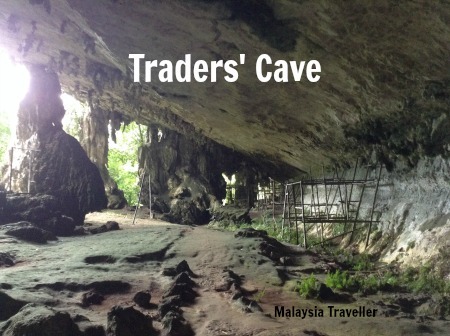 The first cave you arrive at is Traders’ Cave which is really a rock overhang rather than a true cave. There are some wooden structures here resembling scaffolding which are the remains of huts constructed by birds’ nest collectors who lived in the cave with their families for the duration of the harvesting season. The huts were used up until the 1970’s. 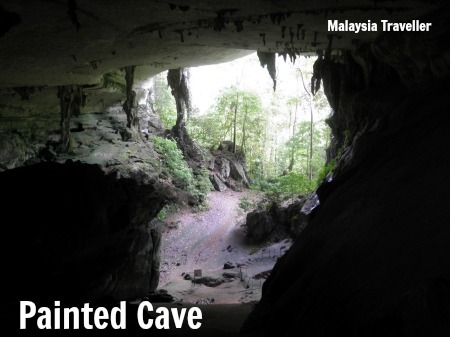 Five minutes walk away is the massive 10.5 hectare Great Cave which you enter through the gaping 250m wide West Mouth which was first explored in 1880 by AH Everett, a government officer and naturalist. The cave contains evidence of human habitation going back as far as 40,000 years making it one of South East Asia’s most important archaeological sites. The pole ladders used by birds’ nest collectors reach up to 60 metres into the highest crevices of the cave and demonstrate the determination and courage of the harvesters. From here keep to the left side of the cave alongside this fence and walk to the back of the cave where wooden steps and a boardwalk show you the way to the next section (you will be returning to Great Cave later via a different route so you can take more photos then). The floor of the cave is covered in a thick layer of brown bat and swiftlet guano, which, complete with craters, gives a strange lunar feel to the cave. As you travel deeper into the cave complex the darkness envelopes you and becomes pitch black (torch essential from here on). My camera managed to see in the darkness however revealing the natural artwork of the cave walls. The trail is on planks here and is pitch black but you will find direction signs from time to time and as long as you stick to the path you cannot get lost. You only have screeching bats and insects for company here. The floor is slippery in places. This photo was taken with a flash. 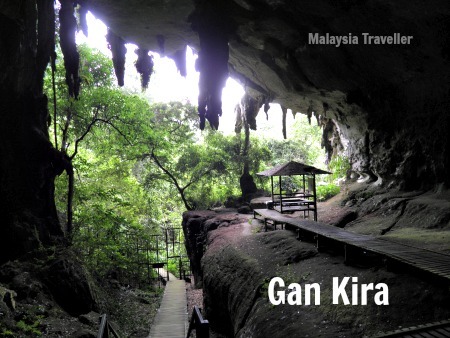 Finally you will be returned to daylight revealing that you are now in another large cave called Gan Kira. Neolithic burial sites, pottery, ornaments and so on were discovered here when the cave was explored in 1959 by Tom and Barbara Harrison. The final cave, the Painted Cave, is another 420m away. Ancient paintings and boat coffins were discovered here. The drawings are fenced off as their condition is deteriorating and fragile. From the first cave (Trader’s) to the last (Painted) takes about 1 hour’s walk. 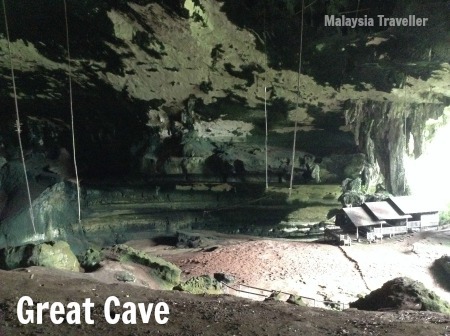 Then you have to come back the same distance so expect to spend 2 hours inside the caves. Add to this the jungle trek to and from the caves and total time walking comes to about 4 hours. Start early. 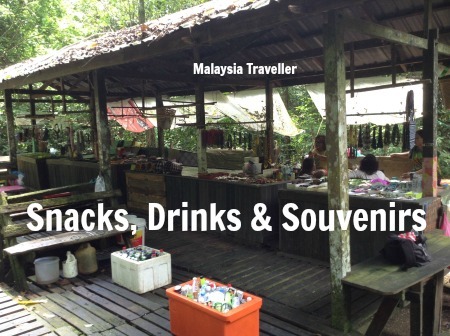 This trip, together with travelling time from Miri and back takes about 7 to 8 hours. It can rain at anytime but is more likely in the afternoons. By starting early you might be able to avoid the rain. I left Miri at 6.30am arriving at the river jetty around 8.30am. I still got soaked by rain though while walking back to the Park HQ after completing the caves. But I had finished at the Park by 12.30pm leaving enough time to visit some of Miri’s beaches on the way back. Bring a Change of Clothes. 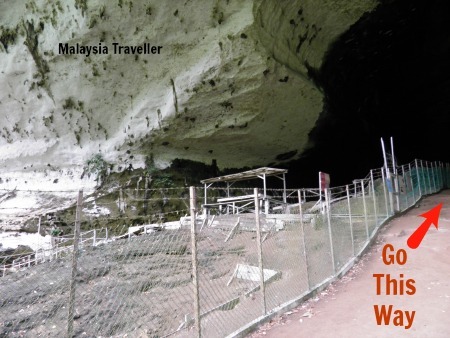 Even if it doen’t rain you will be soaked with sweat after the long walk in the humid caves. If you come by car you can leave your spare clothes in the car and change after the walk. Torch. This is essential! If you are travelling in a group at least one torch per person. If you are alone (like I was) bring two torches and/or spare batteries. I had a headlamp and a hand-held torch. The headlamp is good but lights attract bugs and I found I had swarms of flying insects right in front of my face when I used the headlamp. In the end I switched it off and used the torch instead. Footwear. The plank walk can get very slippery in places and the mounds of bat guano are also slippery. Proper footwear with good grips is essential. Hat. There is a fair amount of bat and bird droppings plopping out of the sky so best to wear a hat unless you think that bat guano makes good hair conditioner. Gloves. The handrails inside the cave are encrusted with bird and bat droppings so you might want to wear gloves if you are squeamish about touching it with your hands. Water. Bring ample drinking water with you. It is hot and humid and you will get very thirsty. There is a stall just before the first cave where you can replenish your fluids but do not rely on it being open. Snack. Likewise bring some snacks to keep your energy up. Children. This is a fascinating and educational place to bring children but if they are too young and not capable of walking for 4 hours without wanting to be carried you might want to go somewhere else. Scared Of The Dark? If any in your party are uncomfortable with dark caves you can just go as far as the Great Cave and then turn back. No Need for a Guide. There is no need for a guide here. The trail is well marked and there will probably be other people around in case of a problem. I was not offered a guide. For those visitors looking to extend their exploration of the park beyond a day trip, there are a number of basic wooden chalets available for overnight stays as well as 5 hostel blocks and a camp site. You can find the rates on Sarawak Forestry Corporation’s eBooking site. For a full list of hotels at Miri at discounted rates please click on the Agoda advert below.